What is it about Bordeaux that turns us either into crashing bores or quivering wrecks? Crashing bores as we recite vintages, classed growths and producers in near-mythical terms; quivering wrecks as we open a £14 bottle with a pretty château on the label not knowing if we’ve picked up a turkey or a gem. It seems there is no middle ground. Which is sad, because below the famous names of Bordeaux’s hallowed left bank Médoc region (Château Margaux, Lafite and the like) are scores of producers turning out beautiful wines at a fraction of the price. But how do you pick these out from poorly-made imitators riding on the Bordeaux name? 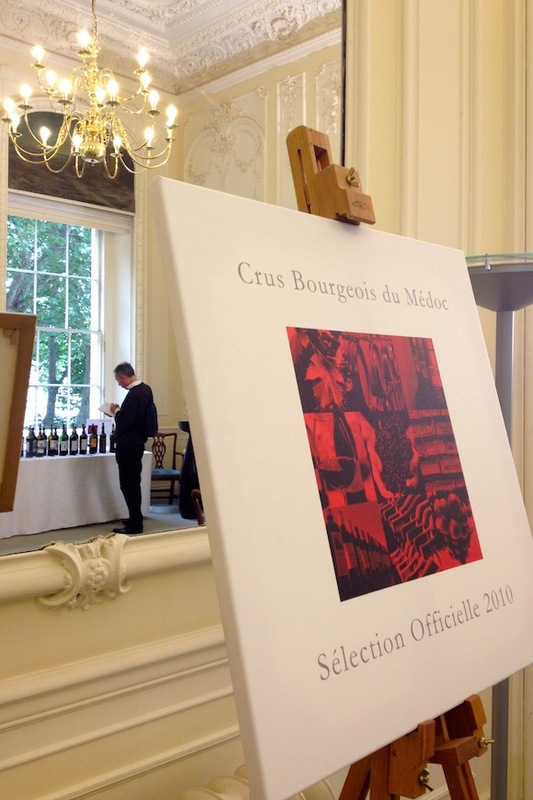 Enter the Alliance des Crus Bourgeois du Médoc, an organisation promoting producers who are not in the top club (that was decided in 1855) but whose wines are judged by an independent panel to be of very good quality. Perhaps I should say Alliance des Crus Bourgeois 2.0 because this organisation itself has had a chequered history. Disbanded in 2003 amid legal action taken by châteaux who were kicked out for quality reasons, it returned a few years later with a new rule. You have to prove your wine is worthy of a “Cru Bourgeois” label every year. “I like to think of it as a seal of approval, rather than a classification,” said wine writer Stephen Brook as he led a tutored blind-tasting masterclass to showcase the selection of Crus Bourgeois from the 2010 vintage. Frédéric de Luze, President of the Alliance, admitted this potential lack of continuity meant it could be challenging to keep the “emotion” of buying a Cru Bourgeois wine. On the other hand, it meant that producers didn’t sit on their laurels, as happened in the past. The site does carry reviews for some of the wines which help indicate if the one you’ve picked up needs time to blossom or can be enjoyed right away. It’s important for consumers to know the difference because these Crus Bourgeois are the wines from Bordeaux that tend to go into supermarkets and high street off licences due to their relative affordability. Frankly, though, with 260 producers in the 2010 vintage, and eight appellations, the information is a bit hit and miss at the moment. So, you either need to be bit of geek to pick your way through or buy from a reliable merchant who can give you advice. Most of the wines I tried need a few years in bottle before they become – as the Bordelais might say – harmonious. Here are some of my picks from the masterclass, and a handful of the wines I liked from a quick sweep around the tasting. These Crus Bourgeois are yet to hit the shelves, and some are still available en primeur. Otherwise, I have stated who stocks earlier vintages (which I haven’t tried apart from Chateau Beaumont). Château Haut Barrail: Class. This is 70% Merlot, and has a supple but vigorous mouthfeel. The 2009 is available from The Wine Society for £11.50. If it is anything like the 2010, that is a good buy. Château Poitevin: A meaty, savouriness on the nose and lots of deep dark fruit on the palate, it’s quite modern and one to get the young red-trousered fogeys all excited. Lea & Sandeman have earlier vintages. 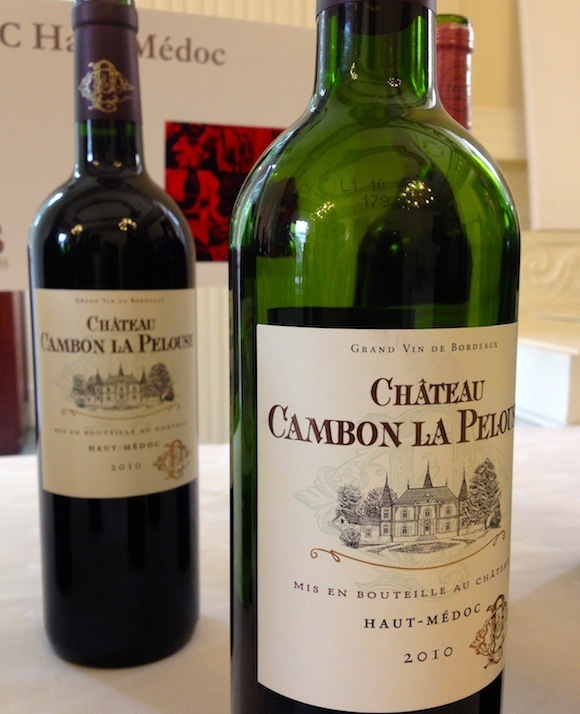 Château Cambon de la Pelouse (tasted blind): three or so more years in bottle and this pretty, perfumed, satin-textured wine will be an absolute joy. It’s at the more expensive end though, around £20 RRP. You can buy it through Fine & Rare. Château Charmail (tasted blind): juicy black fruits, a lingering creamy backnote, good, tasty posh Sunday lunch fare. Could be enjoyed now if decanted. The Wine Society currently stocks the 2007. Château de Gironville: Cassis, cassis,cassis. Yes, it smells and tastes intense, but it doesn’t feel correspondingly big and weighty. Nice structure. Fine & Rare is your place to go. Château Beaumont: a Wine Society members’ favourite for its classic cassis and pencil shavings flavour combo. The same producers make the Society’s Exhibiton Haut-Médoc. Château Saransot-Dupré (tasted blind): smells like prunes soaked in tea held in a leather cup. It may not sound that charming, but believe me, it is. Drinks of France stock it, though it is not clear which vintage. 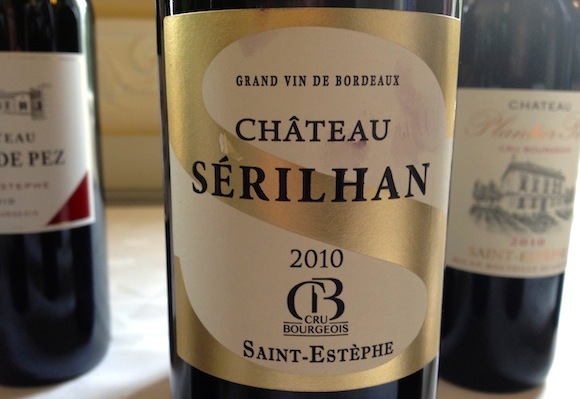 Château Sérilhan (tasted blind): A modern style Claret according to Stephen Brook. That probably explains its immediate appeal – it feels fleshy but elegant to drink, juicy and a little creamy. If you couldn’t hang on for a few years, you could enjoy this decanted – with food. At the higher end of the price range. Available from En Primeur Ltd. Earlier vintages are available from Harrods. ** One final note. Cru Bourgeois-labelled wines are not ranked. They used to be, and you will find producers still using terms like Cru Bourgeois supérieur. Currently, it is meaningless. The Alliance is talking to the French Government about re-introducing different levels of quality. But it is also keen not to confuse consumers even further. The idea is to stop the quivering, not induce it!